me SWERDLOW acted as if he was some type of law attorney in regards to medical marijuana. He told me after demanding SWERDLOW leave the location several times and SWERDLOW refusing Det. BARTA took SWERDLOW into custody for PC 145. Prior to searching the residence I photographed the interior and suspected marijuana. I took 3 rolls of 35mm film, which eventually was packaged and placed into Sheriff's evidence and sent to Sheriff's crime lab for processing. 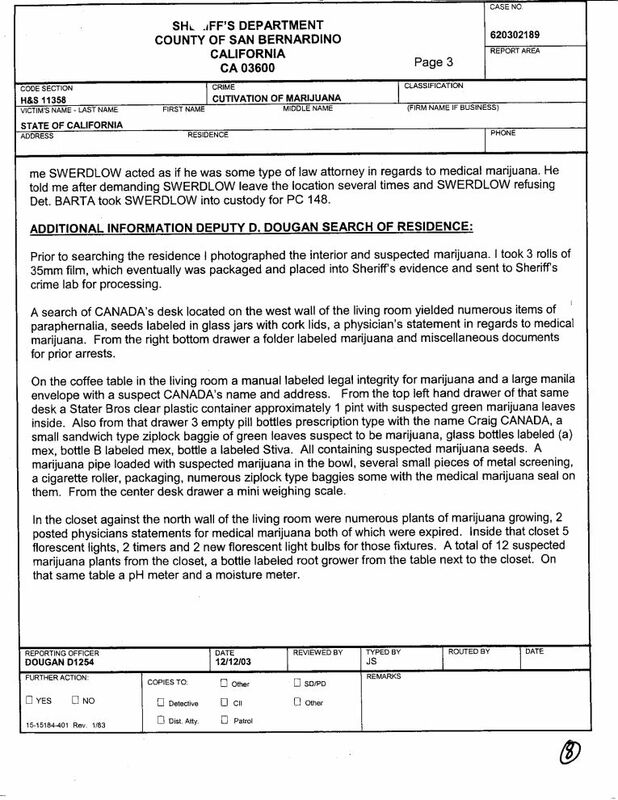 A search of CANADA's desk located on the west wall of the living room yielded numerous items of paraphernalia, seeds labeled in glass jars with cork lids, a physician's statement in regards to medical marijuana. From the right bottom drawer a folder labeled marijuana and miscellaneous documents for prior arrests. On the coffee table in the living room a manual labeled legal integrity for marijuana and a large manila envelope with a suspect CANADA's name and address. From the top left hand drawer of that same desk a Stater Bros clear plastic container approximately 1 pint with suspected green marijuana leaves inside. Also from that drawer 3 empty pill bottles prescription type with the name Craig CANADA, a small sandwich type ziplock baggie of green leaves suspect to be marijuana, glass bottles labeled (a) mex, bottle B labeled mex, bottle a labeled Stiva. All containg suspected marijuana seeds. A marijuana pipe loaded with suspected marijuana in the bowl, several small pieces of metal screening, a cigarette roller, packaging, numerous ziplock type baggies some with the medical marijuana seal on them. From the center desk drawer a mini weighing scale. In the closet against the north wall of the living room were numerous plants of marijuana growing, 2 posted physicians statements for medical marijuana both of which were expired. Inside that closet 5 florescent lights, 2 timers and 2 new florescent light bulbs for those fixtures. A total of 12 suspected marijuana plants from the closet, a bottle labeled root grower from the table next to the closet. On that same table a pH meter and a moisture meter.